The WORX Aerocart lets you lift less and do more. It is much more than a wheelbarrow, it is an 8-in-1 all purpose lifter, carrier, mover that lightens every load. The two oversized, balanced wheels make lifting a 300 pound load capacity feel more like 25 lbs. The Aerocart is revolutionary because it makes heavy loads easy to move. The secret is the breakthrough design that places the wheels right under the load for maximum leverage which reducing lifting force by up to 4x. You no longer need to do the heavy lifting and balancing. Unlike single wheel wheelbarrows that can easily tip over with heavy loads, the two wheels provide superior stability. The Aerocart features never flat tires, so it is always ready when you are. The tires are made for both outdoor and indoor use. The Aerocart also features a narrow design which allows you to go through fence gates and doorways with no problems. The all Steel construction makes it tough and built to last. When not in use, the compact design takes up very little storage space. You can even remove the handles and the Aerocart fits in your trunk for portability. The WORX Aerocart comes with four accessories that allow you to do more with this all purpose tool. The all steel cart comes with a Mesh Rock lifter that connects to the extension arms. The Potted Plant Mover strap connects to the extension arms and remains balanced during transport. The Cylinder Holder clips into the frame while in dolly mode and makes moving round objects easy. The Bag Holder also connects into the frame while in dolly mode and allows you to add a bag for gathering leaves, grass clippings or picking up trash or recyclables. The Aerocart has so many capabilities, you will find yourself turning to it more and more. With the Aerocart in cart mode you can grab a trailer ball (sold separately), secure it in the hole on the bottom flap and now you have a personal trailer mover. The Aerocart allows you to move trailers up to 1000 lbs. Worx AeroCart 8-In-1 All-Purpose Yard Cart WG050 New -- Authorized Seller. Full Warranty. Money Back Guarantee. 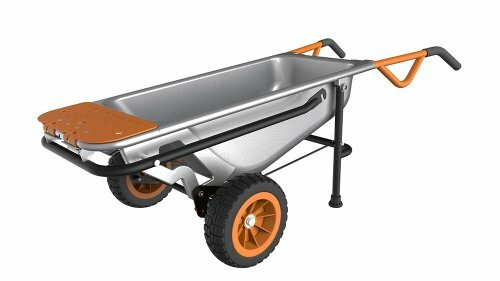 Worx WG050 Aerocart Multi-function 2-Wheeled Yard Cart Dolly Wheelbarrow -- Authorized Worx Dealer + Full Factory Warranty!!! WG050 WORX AeroCart: 8-in-1 Multi-Function WheelBarrow Garden Yard Cart -- Check Out Our Store For Up To 60% Off! 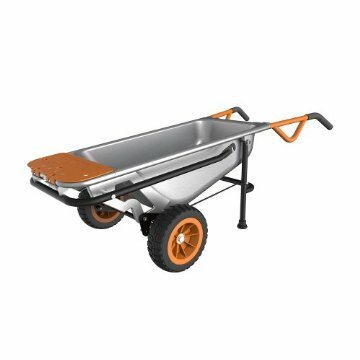 WORX WG050 Aerocart 8-in-1 2-Wheel Wheelbarrow / Garden Cart / Dolly -- Check Out Our Store For Up To 60% Off! Last updated: April 20, 2019 at 11:29 EST. Pricing information is provided by the listed merchants. GoSale.com is not responsible for the accuracy of pricing information, product information or the images provided. Product prices and availability is subject to change. Any price and availability information displayed on amazon.com or other merchants at the time of purchase will apply to the purchase of the product. As always, be sure to visit the merchant's site to review and verify product information, price, and shipping costs. GoSale.com is not responsible for the content and opinions contained in customer submitted reviews.